I’ve already given y’all lots of sneak peeks of the media room in my basement. I’ve already completed a project for the other side of the room, so hopefully I’ll be able to finish the room soon so that I can give you a full room reveal. I wanted to talk to you a little about why I used pops of blue in here and why I mixed so many patterns. First, take a look at this part of the basement before any changes were made. In this before pic, several pieces of furniture have been shoved around to make way for the new media center that we added. Wow – that’s bad – now I remember why we hardly ever used this room. Other than adding the media center, I had to work with the rest of the furniture that I already had – the ugly, pouffy leather couch and the recliners with tapestry’ish upholstery. So I took my lead from the leather on the couch and decided to go with a rustic/industrial vibe. I hoped that some pattern play in the pillow fabrics would distract your eye from the furniture. 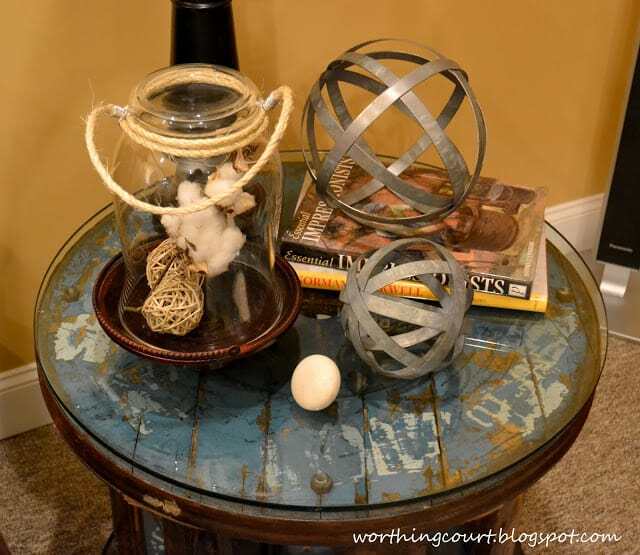 And the blue surface of this industrial style table, that is made from a repurposed spool that was rescued from an old mill, inspired me to add pops of blue around the rest of the room. 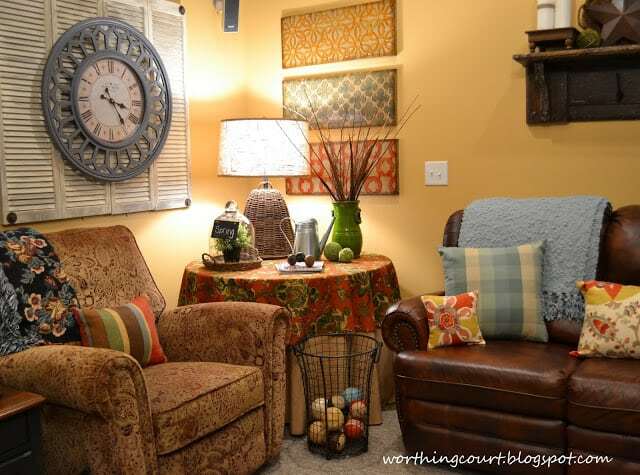 I mixed lots of different fabrics, accessories and things on the walls, hoping to keep the eye from focusing on the furniture that I have no idea why I agreed to buy. Anyway – even though there’s a lot going on, it all somehow works for me. One of my very favorite things is the addition of my new bff, Tuck. Sigh…I’m still in love with him. Pookie just doesn’t get it though. Tuck came from a favorite online shop of mine, Farmhouse Decor. 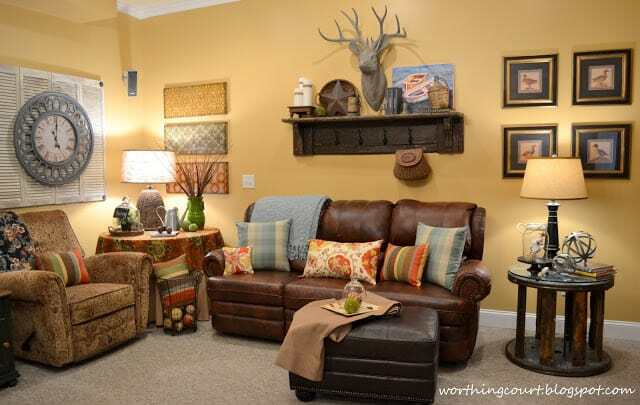 So I hope when you look toward that wall, you’ll notice Tuck and the vintage mantle that I scored for $10 and all of the colorful pillows more than the ugly, pouffy leather couch. I love that Tuck the Buck is front and center. So many lovely details to take in here. Well done. You never disappoint!!! Fabulous my friend!!! 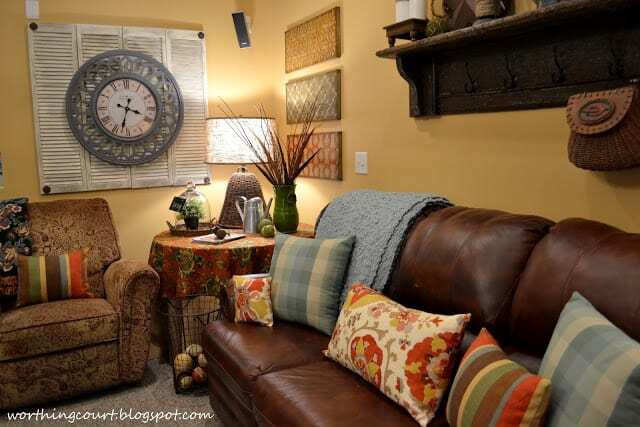 The throws and pillows really transform those couches. They look like Restoration Hardware, not poufy/ugly as you describe them. And I bet they make for good napping and cozy movie nights. I live the blue and all the patterns. They really work. Why do all women hate leather furniture? 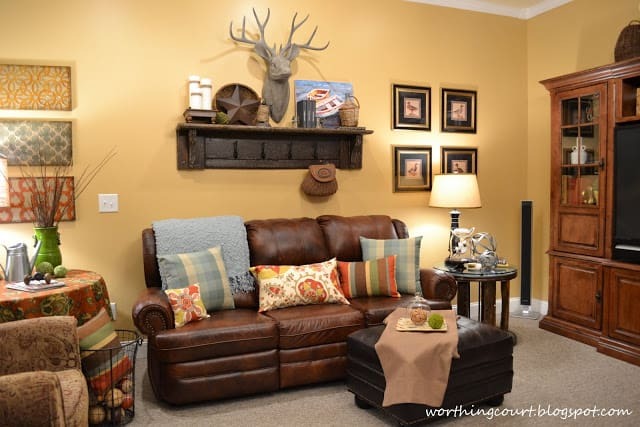 I love that leather sofa. It reclines!!! The only thing it’s missing is built-in cupholders! My gosh, what more could a person ask for than a leather sofa that reclines in front of a BIG SCREEN TV!!!! Add a beer and a brat and you have the definition of Nirvana! PS The only thing better than that sofa is you, the love of my life! 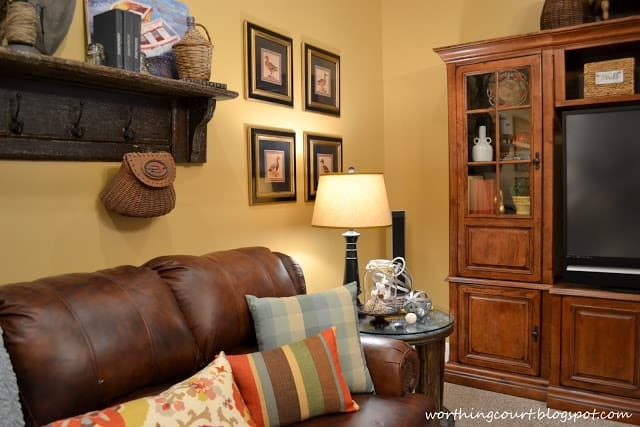 Your family room is going to be fabulous when it is completely finished! 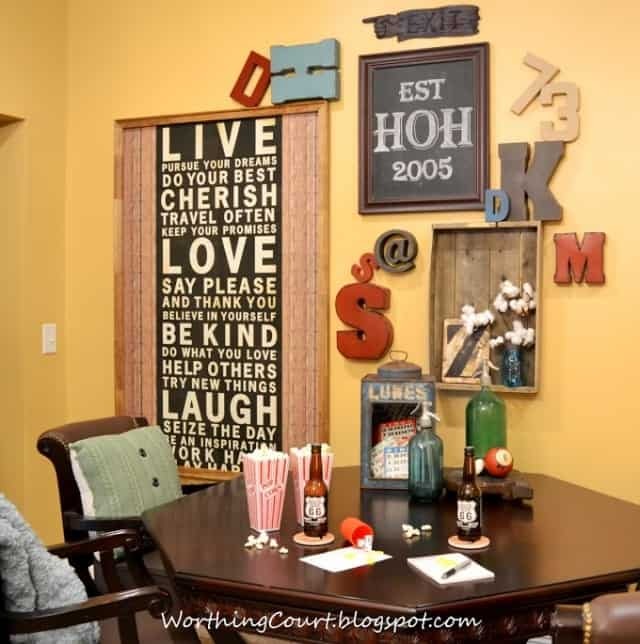 I love all of the little touches, the mixture of color and different pieces…. it just all goes together perfectly! Your room is wonderfully warm and comfortable looking. This is such a lovely room and that spool table is so great. Still love your buddy Tuck! Suzy, your room looks phenomenal! 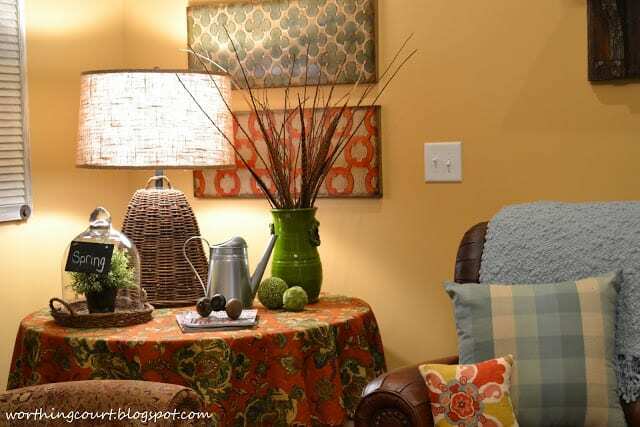 I love all of the beautiful colors, textures and patterns that you’ve blended together! It has such character and is so warm and inviting! 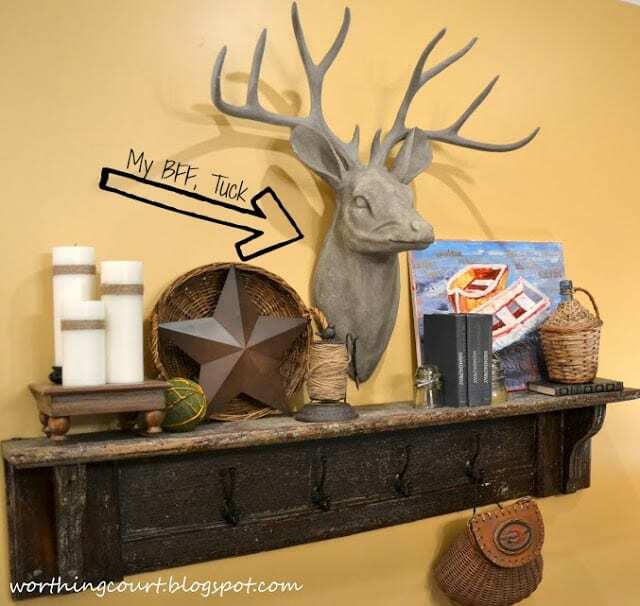 I can envision lots of time being enjoyed in your amazing space … Buck seems to approve, too! Look forward to seeing the full reveal! Great room!! We have a large spool in the garage right now but there is still rope attached. Just maybe Mr. will let me have it. I like your leather couch! I’m in love with your new look. 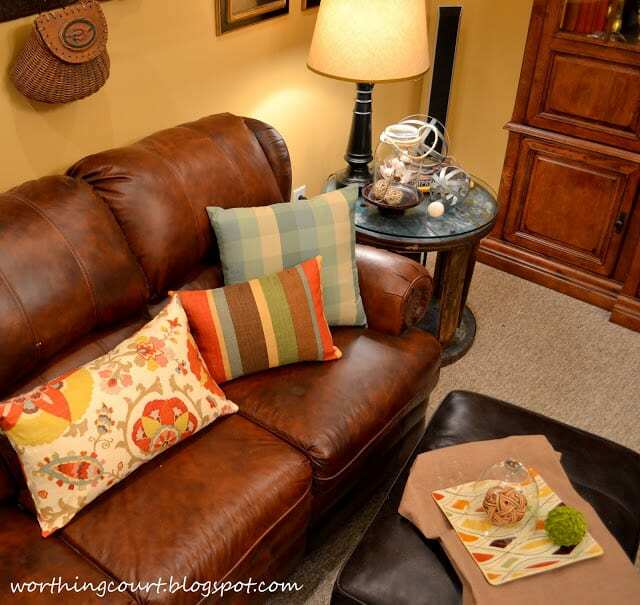 I’m transforming my living room right now and am shopping fabrics for a vibrant dose of color. Thanks for the inspiration! Found you at the Rustic Pig party. What a cozy space. 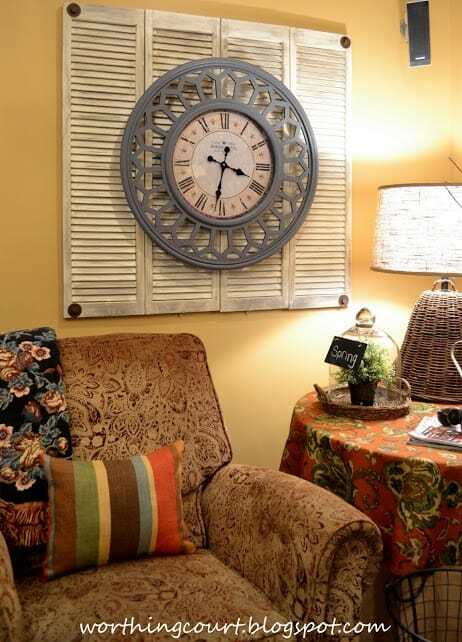 I love how you layered everything to make it look welcoming. (And I think it’s cute that the love of your life left you a comment advocating for the sofa!) I’m visiting from It’s Overflowing. Great Look! Where did you find the rectangular frames.I am guessing those are fabrics you put together inside. How about a tutorial? So glad you like it. Actually, those rectangular frames are metal plaques. But I bet you could find some fabric and make them! 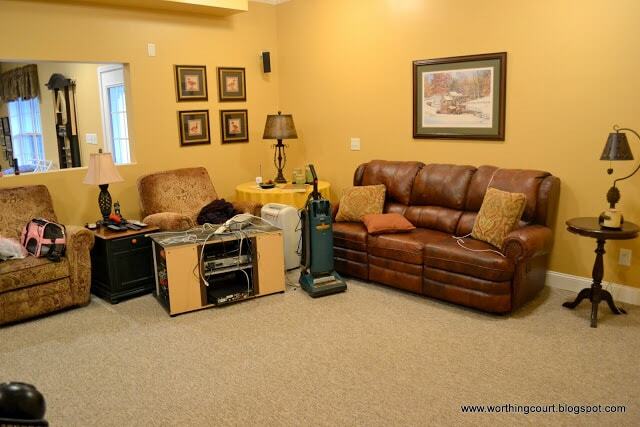 and the beautiful peek at your basement media room. You can see I’ve been spending a lot of time here today. Yikes! Thanks again for the inspiration!